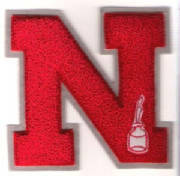 Neoga Township High School "Indians"
Neoga (population 1,854) is located in northwestern Cumberland County off of Interstate 57 approximately 18 miles north of Effingham. U.S. Route 45 runs through the middle of town. Two major railroad systems, the Illinois Central Gulf and the Norfolk & Western, have tracks that intersect on the south side of town. A branch of the Henry Creek flows through the northwest side of town. Neoga genuinely has a rich and storied tradition of providing quality education for its children. The school building pictured above served the town proudly from 1909 through 1978. It is probable the school system was established many years before the brick building was erected. 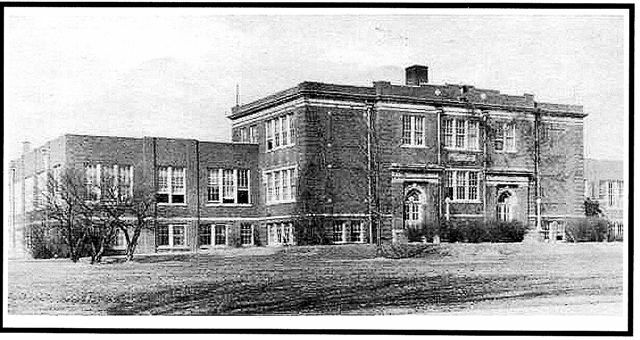 In 1953 the first changes to the Neoga school system took place with an addition added to the building above. This was done to make room for children of several smaller country schools in the area that were closed. The nearby villages of Trowbridge, Etna, and Pioneer did maintain a country grade school however. This was the order for several years until 1978. It was this year that the surrounding grade schools were closed and a time for a change occurred at the high school. The need for a newer, larger building for the students of the Neoga school system was pursued. It was decided to demolish the grand old lady and replace her, causing sadness in the hearts of many of the alumni of Neoga Township High School. The name of the high school was changed slightly, from Neoga Township High School to Neoga Community High School. 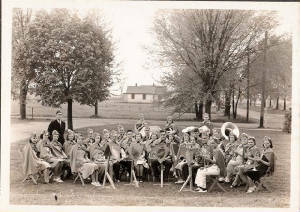 Though the school fight song, nickname, and District number remained the same. 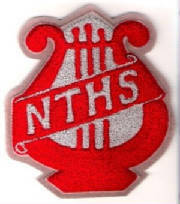 The school colors changed slightly from scarlet and gray to red and white. School Fight Song: Before 1938 - "Cheer Neoga" sung to "Cheer Illini"
The IHSA web site does not recognize the difference between Neoga Township HS and Neoga Community HS. However, following the information supplied by Mr. Young, we will recognize the athletic efforts gained in the old Neoga Township HS building before 1978. Neoga Township High offered basketball, track, and possibly baseball. They competed for many years in the National Trail Conference. Basketball was the feature sport at the school with some of the better players including Max and Bob Young, Dodo Bigler, Pat Wallace, Bernie Hayton, Vernon Greeson, and Dean Walk. Two of the better coaches of the time were Bud Colin and Bob Mirus (Coach Mirus is in the photo to your right). Two of the NTHS teams won District titles. The records and coaches names are not available at this time. 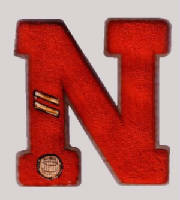 *The Team of 1941-42 - The 1942 Neoga Township HS basketball team went 20 - 7. They won the National Trails Conference Championship and beat perennial power Teutopolis twice that year. Dr. Robert Young is to the left of the conference trophy holding a ball with "41-42" on it. The coach, Bob Mirus, joined the Navy during the 42-43 year. Dr. Young was a Junior on this team and a captain. Phil Worland is in the front row wearing #56. Phil oassed away in February of 2005. 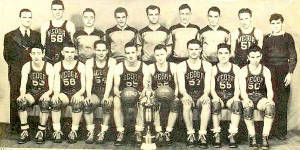 Thank you to Tom Benefiel for supplying the photo and information on the team of 1941-42. Three male athletes brought home medals from the IHSA State Track Meet. 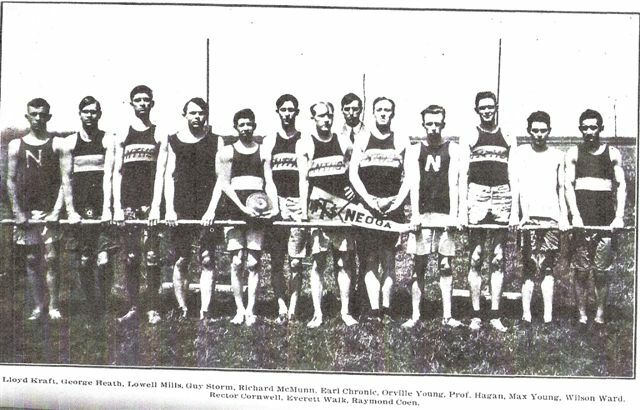 In 1893 in fact, Charles Comstock single handedly led the Neoga track team to a 9th place finish in the state meet. 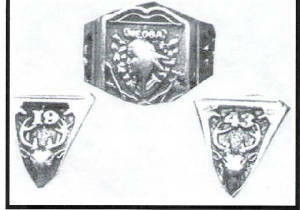 The other two athletes bringing home medals were Fred and Scott Swengel. The accomplishments of these athletes are listed below.